What exactly is a catalytic converter? All vehicles are equipped with a catalytic converter, which is a device that takes in harmful compounds from the engine exhaust air and converts them into less harmful compounds – thereby reducing the amount of pollutants that your vehicle emits into the atmosphere. Depending on the area of the country you live in, different states have different rules governing the sale, replacement, and repair of catalytic converters. At USA Automotive, we are experts at catalytic converter repair here in Raleigh, and we can also offer professional advise as to the rules and regulations governing catalytic converter repair in Raleigh, NC (and surrounding areas). #1- You notice reduced fuel economy. If your catalytic converter is failing, you may notice a significant reduction in fuel economy. #2 – Your engine is misfiring. A misfiring engine can occur for a number of reasons, and it can also cause your catalytic converter to overheat. Often caused by the presence of an extra rich fuel mixture, raw fuel enters the catalytic converter and is ignited, which can lead to your catalytic converter overheating or melting. #3 – Your vehicle isn’t performing as well as it should. When exhaust becomes trapped in front of your catalytic converter, it causes a reduction in performance because it makes it feel as though there is no fuel reaching the engine. #4 – Your catalytic converter is clogged. Our mechanics will be able to perform a test to determine whether there is a clog in your catalytic converter. Signs of this include loss of power when accelerating, poor fuel economy; transmission takes longer to shift into higher gears when driving. #5 – You hear a rattling noise under the car at times. If your catalytic converter substrate has broken internally you may hear a rattling noise, especially when you start the car; change gears from Park to Reverse or to Drive and when stopping and shutting the car off. The substrate could be damaged due to a lean or rich fuel mixture or it was hit externally. #6 – Your vehicle is emitting an excessive (illegal) amount of emissions. If your mechanic notices a raised level of carbon emissions from your exhaust system, it may be due to a failing catalytic converter. Failure to replace your catalytic converter at this point may cause damage to other components in your vehicle’s exhaust system. Replacing a catalytic converter is something that is best left to our professional mechanic auto shop – especially since there are stringent rules governing the proper use and operation of catalytic converters. Your catalytic converter plays a significant role in determining whether your car passes or fails an inspection. In Wake County and surrounding counties, passenger vehicles are required to pass a safety and emissions test, so if your catalytic converter is in need of repair or replacement, your vehicle may not pass inspection. 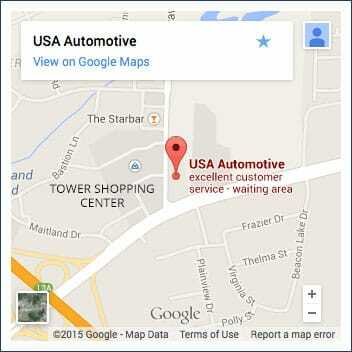 If you suspect that there may be problems with your catalytic converter, stop by USA Automotive, or give us a call. We’ll be glad to take a look and get your vehicle back on the road and running safely in no time! Call today at: (919) 249-5295. We’re Raleigh’s most trusted automotive shop for catalytic converter repair and replacement!